Everyone in the sheltering world has good reason to fear an outbreak of canine parvovirus in their facility. But could that fear be blinding us to new ways of thinking about this disease? Humans have a tendency to be more afraid of some diseases than others, often for reasons that have little to do with the relative threat of the pathogen's prevalence, transmissibility or severity. Ebola, leprosy, smallpox, some strains of influenza, SARS - whether it's media hype or memories of pandemics of the past, they frankly terrify most people even though we're far more likely to die of cardiovascular disease brought on by lifestyle factors than any of those pathogens. In 1978, Susan Sontag wrote an influential essay, Illness as Metaphor, in which she examined the effect of language on how humans thought about cancer. She argued that the disease was discussed in hushed terms of shame and stigma, adding to both the suffering of patients and the perception that the disease was untreatable. In 1989, she wrote a companion volume, AIDS and Its Metaphors, in which she discussed her own experience of being treated for cancer and how the common military metaphors used to discuss the "battle" against the disease tended to be demoralizing to those engaged in it. Those metaphors, she wrote, "have very real consequences: they inhibit people from seeking treatment early enough, or from making a greater effort to get competent treatment." Has that happened to us with canine parvovirus (CPV)? Have we talked ourselves into seeing it as untreatable, even though it has a far better survival rate than many other diseases? Are we potentially cheating shelter dogs out of "competent treatment" because of fear? Until the emergence of H3N8, the canine influenza virus, in 2004, parvo was the first new disease to affect dogs in modern times. Its particular history, as well as its symptoms and outcomes, may as well have been tailor-made to inspire terror in the hearts of dog lovers, and make it hard for us to believe in its treatability. An outbreak of fatal canine gastrointestinal disease erupted without warning in the 1970s. It struck simultaneously in different parts of the world at a time when global travel was less a factor in disease spread than it is today. No one knew what it was, what caused it, how to prevent it, or how to stop it from killing every dog it touched. Dog owners would leave for work in the morning and come home to find their beloved companion dead or dying. Puppies would sicken and die in hours. People stopped showing their dogs, stopped boarding them and stopped letting them congregate with other dogs. Researchers did eventually discover the cause of the new disease. The pathogen responsible for so much death and suffering was identified as canine parvovirus, a new virus similar to the feline panleukopenia and mink enteritis viruses. Veterinarians began using the cat and mink vaccines to protect dogs, with some success. Additionally, some dogs who had been exposed to or recovered from the disease itself had developed natural immunity. Eventually, specific CPV vaccines, initially of varying efficacy, were introduced, followed later on by more reliably effective vaccines. Research continued, and more information about prevention, treatment and the special considerations for immunizing puppies was published. From once being almost universally fatal, today, parvo is an eminently treatable illness. Veterinary Information Network consultant Wendy Brooks, DVM, DABVP, says that, with treatment, the disease has a survival rate of between 75% and 80%2. Brian DiGangi, DVM, MS, DABVP, of the University of Florida pegs it at 60% - 90%3. 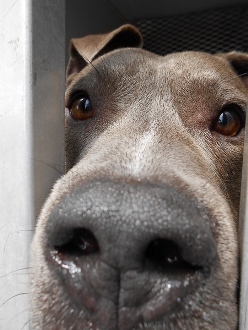 When asked to explain their decisions to the media and community members, spokespeople for many of these shelters use words like "forced," "had no choice," "fatal," and "deadly," creating the impression that the disease is not treatable and all affected dogs, perhaps even all exposed ones, will inevitably succumb. In part, that perspective arises because parvo presents particular challenges in the shelter environment, including a long period of persistence on surfaces and in soil, and a window of vulnerability to the virus that affects even well-vaccinated puppies. Finally, there is not a great deal of shelter-focused information on treating parvovirus, and until very recently, most of what was available was pessimistic about the cost, difficulty and likelihood of success if such treatment were attempted. None of that changes the fact that parvo is a treatable disease. Would that have been accomplished, or even attempted, if all those involved had their minds made up that parvo is a death sentence, and that treatment is beyond the resources of an animal shelter? Would those puppies' lives have been saved if the veterinarians and staff at APA had allowed fear, rather than evidence, to dictate their actions? In reference to her own condition in Illness as Metaphor, Susan Sontag wrote, "As long as a particular disease is treated as an evil, invincible predator, not just a disease, most people with cancer will indeed be demoralized by learning what disease they have." With canine parvovirus, it's the dogs who have the disease, but it's the demoralization of the humans who care for them that's the problem. Shelter dogs, unlike human patients, can't advocate for themselves. They can't write essays about their experience of parvovirus as Sontag did about her cancer. That's why those of us in the sheltering field need to wrap our brains around new ways of thinking about parvo in shelter dogs, and find new words to talk about it. A good place to start is to use accurate language to describe CPV - words like "fatal" or "no choice" does not correctly describe a virus that most dogs can survive with treatment. Of course, this isn't really about language. The story of CPV is being told in the laboratory and the veterinary hospital, not in a literature or psychology class. We can't cure or prevent disease simply by talking about it differently or fearing it less. But Sontag's writing did influence how we talk about disease, and became part of a patient activism movement that ultimately led to better therapies for cancer, HIV and countless other health conditions. For that reason, if parvo is a treatable disease - and evidence tells us it is - we need to start calling it that. 1. Schultz, RD, MS, PhD, ACVM; Chair of the Department of Pathobiological Sciences at School of Veterinary Medicine, University of Wisconsin-Madison; personal correspondence with Maddie's Fund®. 2. Brooks, Wendy; Parvo: The Physical Illness and Its Treatment. 3. DiGangi, Brian; A Shelter-Based Approach to Canine Parvovirus Treatment. 4. College of Veterinary Medicine & Biomedical Sciences, Colorado State University; New Protocol Gives Parvo Puppies a Fighting Chance When Owners Can't Afford Hospitalization. 5. 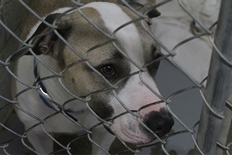 Providence Journal, (2010); Parvovirus outbreak at R.I. shelter prompts euthanasia of 21 dogs. 6. News 14 Carolina, (2013); NC animal shelter forced to euthanize all its dogs after parvo outbreak. 7. CBS Atlanta, (2012); 62 dogs euthanized, parvo outbreak at Pickens County animal shelter. 8. WTVC News Channel 9, (2013); Parvo Outbreak-31 Dogs Euthanized. 9. 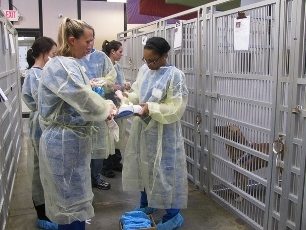 CBS Houston, (2013); Animal Shelter Euthanizes 60 Dogs After Parvovirus Outbreak. 10. Litster, A., et al., Prevalence of positive antibody test results for canine parvovirus (CPV) and canine distemper virus (CDV) and response to modified live vaccination against CPV and CDV in dogs entering animal shelters. Vet. Microbiol. (2012), doi:10.1016/j.vetmic.2011.12.030. 11. Ellen Jefferson, DVM, Saving the Bottom 50%. Maddie's Institute video. 12. Austin Pets Alive! ; Parvo Puppy ICU. 13. Ellen Jefferson, DVM, Treating Canine Parvo Virus. Maddie's Institute video.